It's Dedicated to Special People Like You who take the time to let us know that we are doing a good job. That’s perfect!!! I knew you would do a good job on that bus after seeing the other model u made me!! Just wanted to let you know that I got the bus and it looks awesome. and that is what prompted me to purchase one and in the future a couple more or so. It is true many do not read the page. page and that you are the artist in all this impressive work. Thank you for receiving my order. Have a Blessed week and success in all you do. shows in the amount of care and detail you put into your projects. I look forward to doing business with you again soon. I received my school bus model today. And I want to thank you so much for all your time and effort, the model is awesome. Everybody loves it at my school bus terminal. Thanks again Frank. And I will definitely tell all my friends about you guys. Thank you guys at FJ Models and keep up the good work. 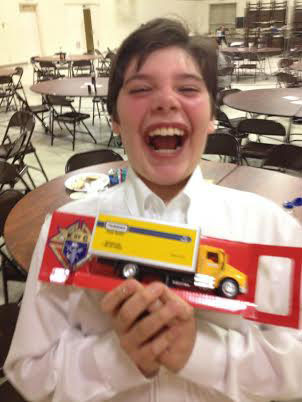 Here is Brett receiving his NEW PENSKE truck as a gift for helping his church community. (2015). I just received my school bus model and I have to say the quality and detail is superb. I purchased a "loaded" 2009 Blue Bird Vision model and was very pleased as it was designed as an exact replica of my own bus that I drive everyday. I will definitely be returning to purchase another model when I get a new bus. I am a school bus driver and if anyone is debating on whether to purchase a model from FJ, it is definitely a go. Frank can customize it to your exact specs, almost like specifying an actual bus. From the lettering to the reflective decals, Frank is on it. How thoughtful of you to take the extra effort to make the bus even more special for my little guy. He just asked me about it over the weekend , so I will let him know that you are making his bus even more customized. Thanks so much, Can't wait to see the bus when it's done. I received the buses today, before we get to those I want to thank you for taking the time to work with me through email to see that everything gets done to the last little detail, for spending so much time on my order, and thank you for sending me photos of the product in production so I can actually see what it looks like before it is finalized and gets to my house! As for the buses, they look extremely good, it is amazing to see how you can take a plain model and add detail to make it look 100% more realistic! The International is very impressive with the white roof, I have a stock model and never knew how much better it really looked with the white roof. The wording and placement are exactly like they are on the real buses here, and I appreciate the extra details you added to the Thomas C2 model! I am also happy to get the Blue Bird bank that I was missing from my collection! You do quality work, and are great with what you do! I am glad to have found a great place to work with, all of my custom bus orders will be made with FJ Buses! Just a quick note to let you know that my below order was promptly delivered to me here in Jeddah, Saudi Arabia, on saturday 6 August. All the items are in perfect order. Thanks for the quick shipping and quality products. Old fashioned business methods. I've found a place to come back to again and again!!! WOW that looks EXCELLENT Frank, you've outdone yourself, haha. Yes, the Gmail is really weird to use, I still can't get used to it, so I keep using Yahoo, it is a lot easier. I love the buses, and I love the fact that you were indeed able to get the number in the location on the front like the real bus! They both look great! Is the International going to have the STOP ON SIGNAL on the rear as well? Subject: You are the Man!!! 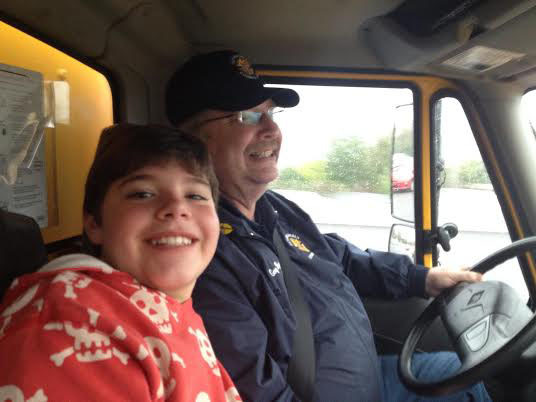 Got my bus and he loved it!!!!!!! Now let’s work on Cash Money Bus!!!! You have reached the top of the ladder!!!!!!! Thanks! I received my order today and I wanted to tell you how much I appreciate the extra stuff you put in there!! I was thrilled to see that the buses had white tops and thomas logos, I've always loved how the white looks on a freightliner/thomas. I put one of the keychains on my car keys to show it off, and plan to use the pens until they run dry! Next time I'm in the market to add more to my collection I will definitely be buying from you! I also got a kick out of the inspection stickers on the bottom of the buses haha I will most certainly be keeping them there!